Detect the wear particles in lubricant generated in the sliding/contact parts such as bearings and gears, then identifying the condition of target portion by analyzing the wear particle morphology, size, concentration, colour and composition. As comprehensively evaluating them, diagnose the degradation condition, identifying wear parts and remaining life. This is the essential diagnostic technique of machines for CBM, such as identifying of optimal overhaul time, increasing of operation availability, reduction of maintenance costs and early detection of abnormal signs. It enables to know the condition of machines in a short time without overhaul, furthermore not necessary to stop facilities for TRIBODIAGNOSIS. We have been carrying out TRIBODIAGNOSIS more than 20 years and providing a reliable diagnosis based on extensive experience, expertize and accumulated data. It is widely utilized mainly in electric power companies as a key technology for reviewing of overhaul demand or extension of periodic maintenance. 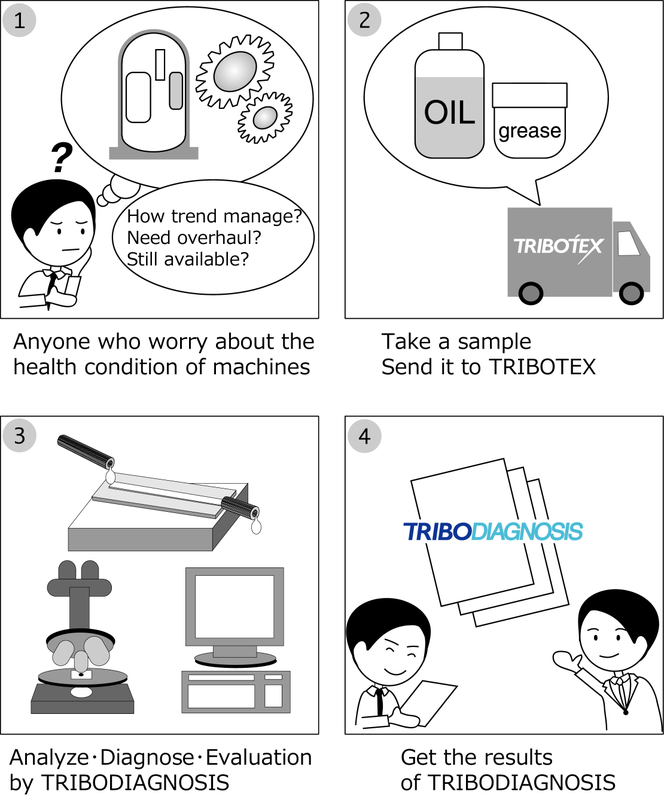 TRIBODIAGNOSIS is not only to detect early signs of changes in lubrication condition, but also useful for diagnostic confirmation of the health of machines. If it has been carrying out as regular checkups from the start of operation, the trend-lines of condition changes will be available for each machines. In other words, it enables to reduce maintenance costs effectively through trend management. TRIBODIAGNOSIS catches a minute change of lubrication condition and achieves an effective condition monitoring. A trend management brings the remaining life prediction. 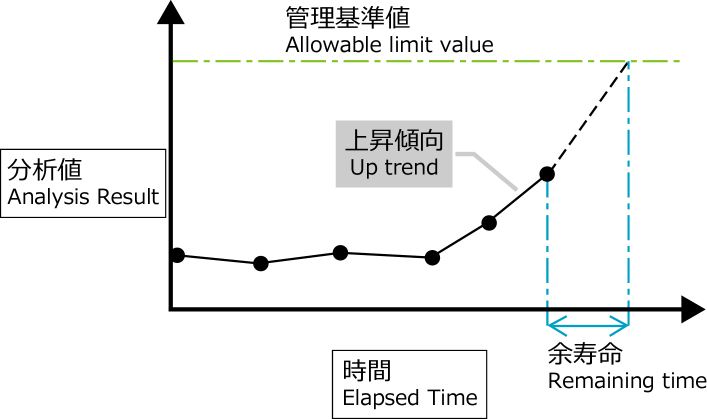 To predict the remaining operation time to reach the threshold by detecting the point of deterioration trend of the target machine, which is set an allowable limit value. 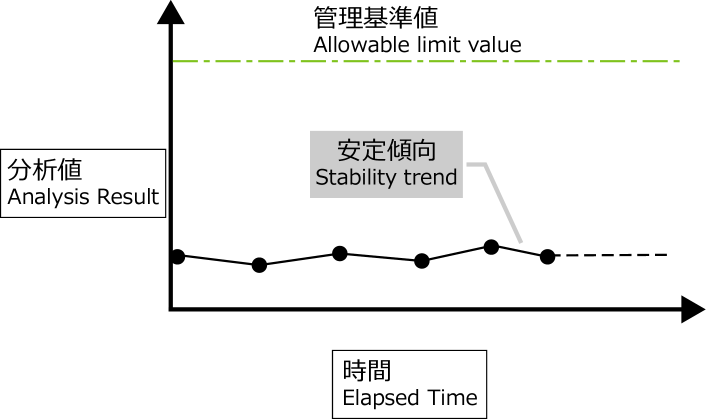 As TRIBODIAGNOSIS is possible to detect the deterioration trend earlier than other condition monitoring techniques, it means that predicting the remaining life is also earlier. ※ The prediction is difficult in the period whilst the analysis result is in stable. We offer a variety of types of TRIBODAIGNOSIS as diagnostic purpose. ・ Analysis not listed on the contents are available. ・ Standard due date is six business days*. If hurry, please contact us. ・ Any questions about a combination of items, types of TRIBODAIGNOSIS, et al. please feel free to contact us. *Depends on the number of samples or the requirements, the due date may be more than six business days. ※For Grease's [Ferrography] [SOAP], preprocessing required such as the dilution, et al. Copyright（C） TRIBOTEX All Rights Reserved.